"That's it. The Rebels are there." 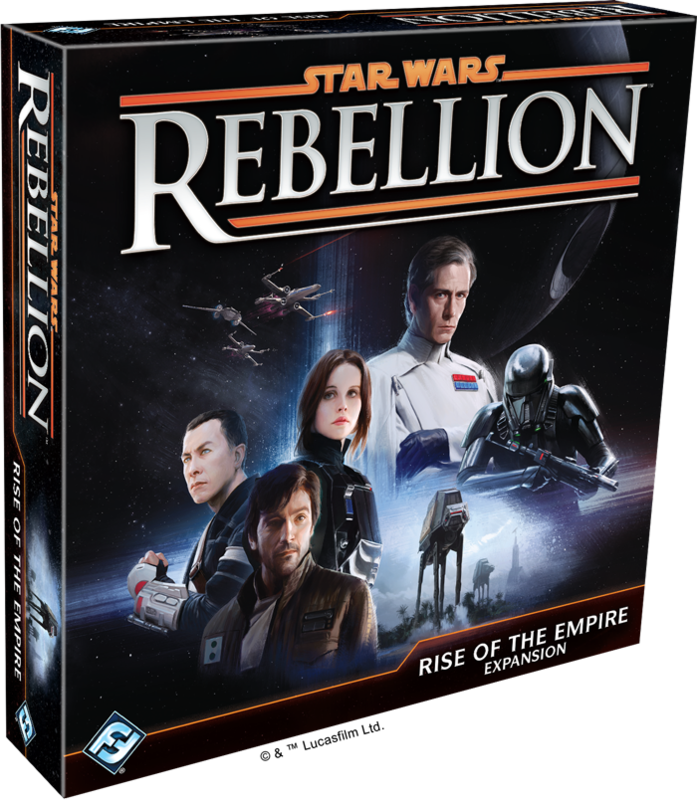 The Rise of the Empire expansion for Star Wars™: Rebellion is nearly here, and in anticipation of the new, action-packed conflicts and narratives it will soon allow you to enjoy, we are happy to make its rulebook available for download (pdf, 1.4 MB)! A Dark Time. A Time for Subversion. Heavily inspired by the characters and events of Rogue One, Rise of the Empire carries us back to one of the galaxy's darkest hours. And while the expansion's rules may grant you a better appreciation for how you'll wage your conflicts in this new chapter of the Galactic Civil War, they simply cannot illustrate the full scope of your upcoming struggles. The Republic is no more. The last remnants of the Senate have been swept away. In their place, the Galactic Empire looms across the galaxy. Palpatine, its tyrannical, self-appointed Emperor, exerts his will via Star Destroyers, Stormtroopers, and TIE squadrons. These machines of war inspire fear and keep the local systems in line. Still, all hope is not lost. Even under the crushing weight of Imperial oppression, small bands of insurgents have come together to form a fledgling Rebel Alliance. Driven by little more than their dreams and ideals, these brave freedom fighters risk their lives on daring secret missions and surgical military strikes. Bit by bit, they hope to chip away at the Empire's aura of invincibility and inspire the galaxy to open rebellion. After ridding Sullust of Imperial forces, the Rebels play Raid Imperial Factory to advance the reputation marker by one. And these are the struggles at the heart of Rise of the Empire and Star Wars: Rebellion. Confronted by the Empire's overwhelming military might, the Rebel Alliance must play a shrewd game of cat-and-mouse—striking whenever it recognizes a moment of Imperial weakness, and then retreating to the safety of its hidden base. And to prevent the Rebellion from inspiring systems to open revolt, the Empire must quickly uncover the Rebel base and destroy it. The game plays out over the course of secret missions, political excursions, and military confrontations. And while much of the game's Star Wars feeling comes from the asymmetrical nature of this lopsided struggle, a good deal more comes from the flavor of its missions and battles. 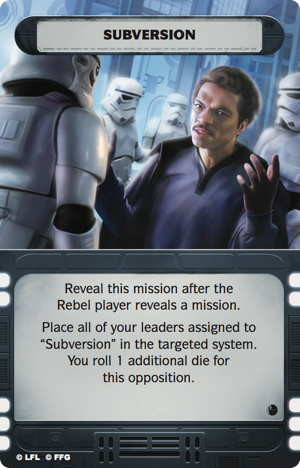 While our other previews pay a good deal of attention to the new missions, leaders, action cards, and cinematic combat coming in Rise of the Empire, we've withheld one key mission for just this moment— Subversion . A mission worthy of its own preview, Subversion presents a whole new level of bluffing. 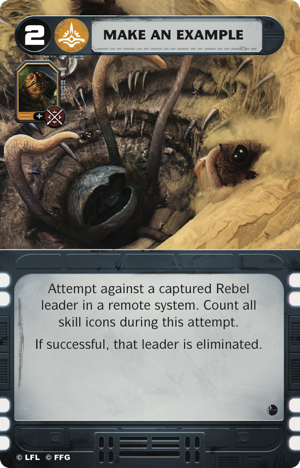 As the game's veterans already know, most of the action in Star Wars: Rebellion is driven by its leaders. If you want to attempt secret missions, you need to assign leaders to them. If you want to move your troops or your fleet to engage the enemy, you need a leader to direct that movement. If you want to prevent your opponents from completing their own missions, you need leaders available to respond. This means that, until the introduction of Subversion, you were limited in your ability to disguise your response to an enemy mission. Either your leader was assigned to a mission, or it was held in reserve in the leader pool. Either way, your opponents would have knowledge of that leader's status. Now Subversion allows you to mislead your opponents in ways you previously could not. 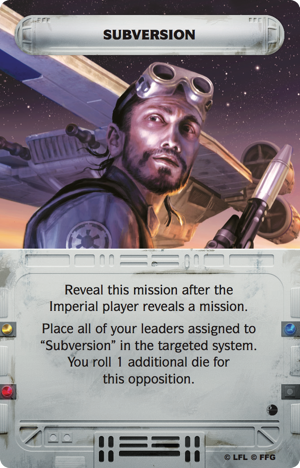 Instead of keeping Jyn Erso and Cassian Andor in the leader pool to oppose your opponent's mission, you can assign them to Subversion. This way it looks like they're assigned to a mission and unavailable to oppose a critical Imperial mission—such as when Jabba the Hutt attempts to Make an Example of Mon Mothma by feeding her to the sarlaac. Then… surprise! Jyn and Cassian are suddenly able to oppose, relocating to Jabba's system, and bringing all their skills to Mon Mothma's defense. More than that, Subversion even grants them an extra die! 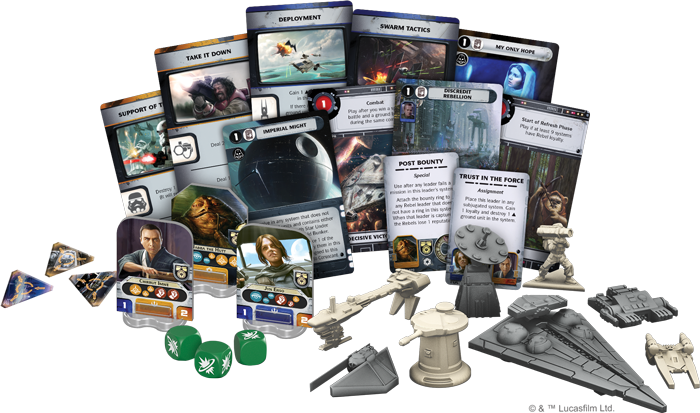 These are the sort of bluffs—and cinematic moments—that live at the heart of Rebellion, and they've earned it a place among the highest-rated, most acclaimed board games of all time. 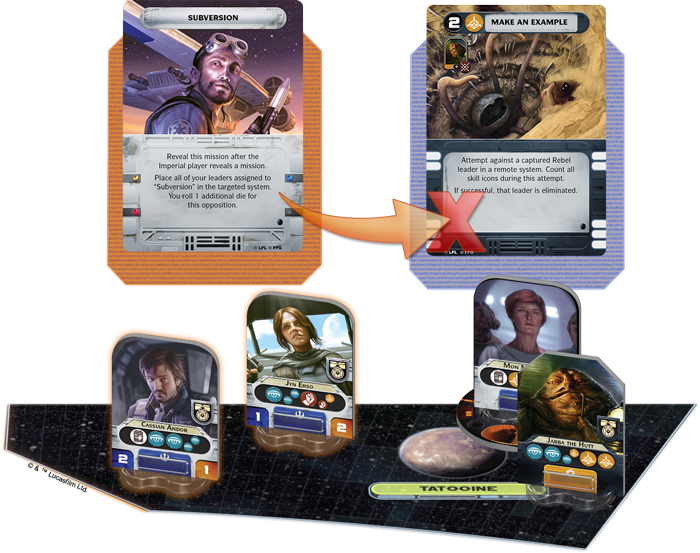 They also illustrate how the game and its themes are intricately woven through not just its rules, but also its lopsided setup, secret missions, and character-specific action cards. Finally, Subversion is such a rich and effective part of the Rebel response in Rise of the Empire that the Empire has adopted the tactic itself . Both sides are able to make use of this new card. 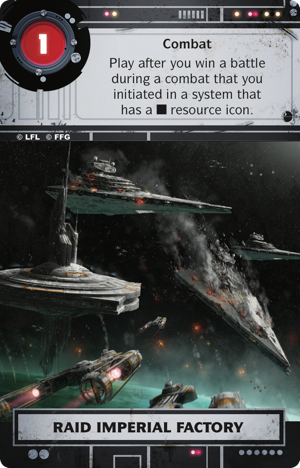 More than this, the expansion doesn't just make the mission available for the games you play with the new Rise of the Empire missions, it also makes it available for the games you play with an enhanced and redefined set of core missions. Strike to crush the Rebellion. Or fight for the cause of galactic freedom. Either way, you'll soon have your chance to explore the newest chapters of your ongoing Galactic Civil War. 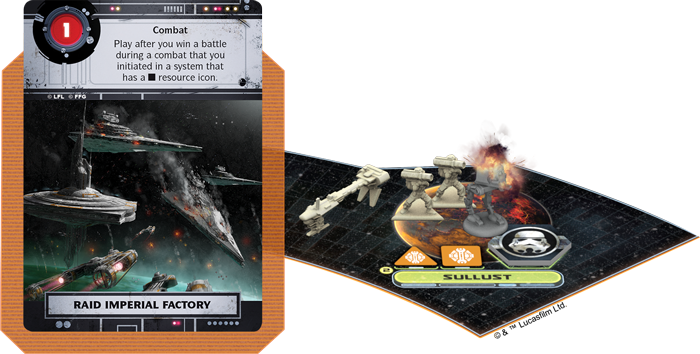 Rise of the Empire (SW04) is scheduled to arrive at retailers by the end of the month!